real life projects. real world impact. 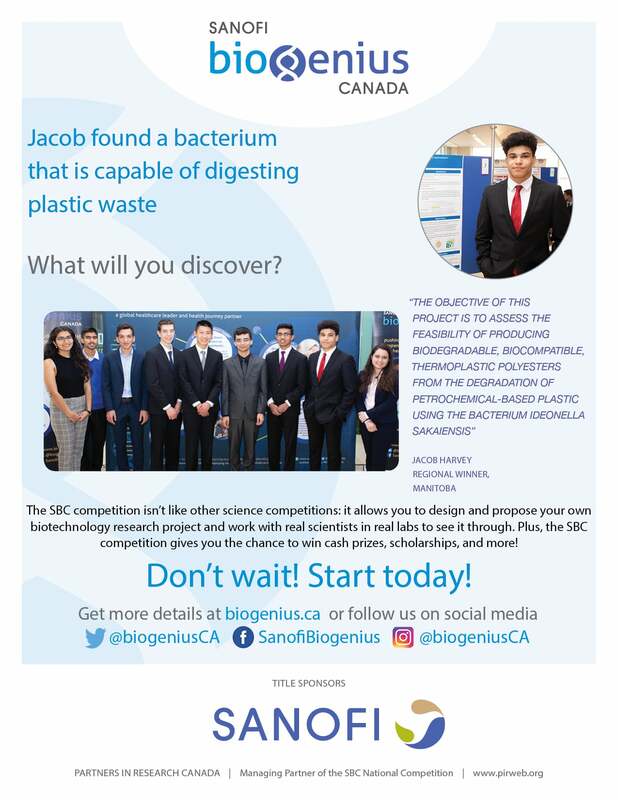 This is no ordinary science fair. 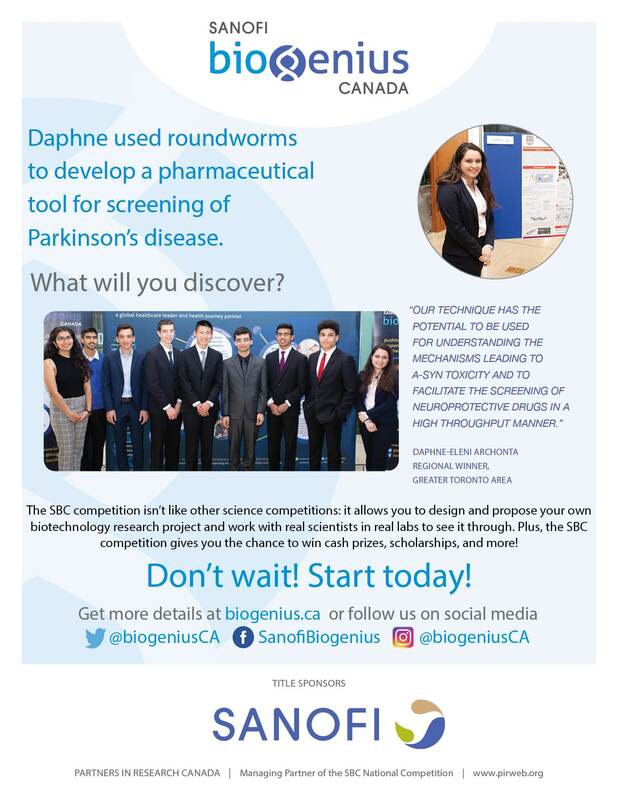 Those selected for the SBC competition are matched with local mentors, giving students hands-on research experience in a professional lab setting. Participants compile their results and present their findings at regional competitions. Cash prizes are awarded and regional winners advance to the National stage, where they vie for the top spot and the chance to compete in the International Biogenius Challenge, held at the prestigious BIO International Convention – the largest biotechnology event in the world. In past years, participants’ elite research projects range in topic, from cancer and Alzheimer’s disease, to agriculture and the environment. Many have since been patented and commercialized, garnering international media attention and igniting a true culture of innovation in Canada. For many participants, the SBC has proven vastly influential in mapping out future careers – in some cases paving the way for studies in ivy league schools and exciting internships in the biotech industry. 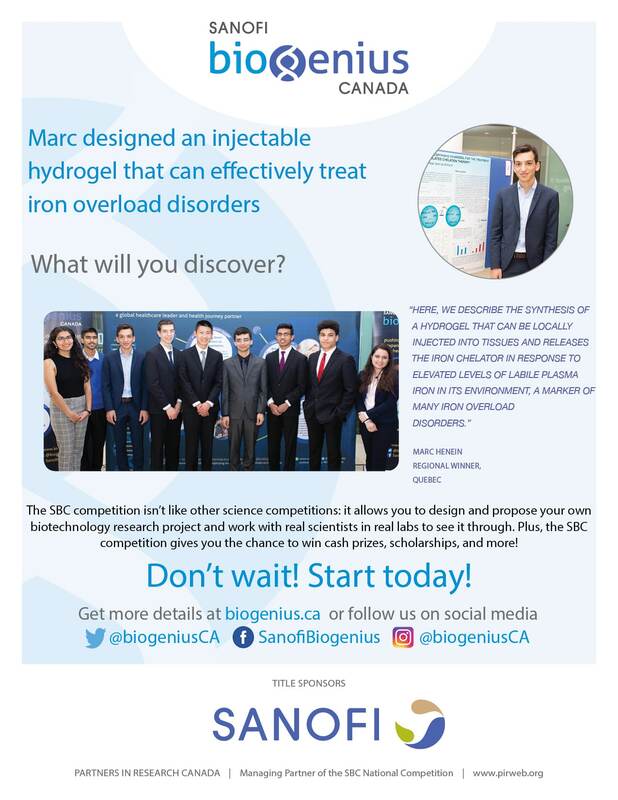 Do you have an idea that can help change the world? Click here to take part. 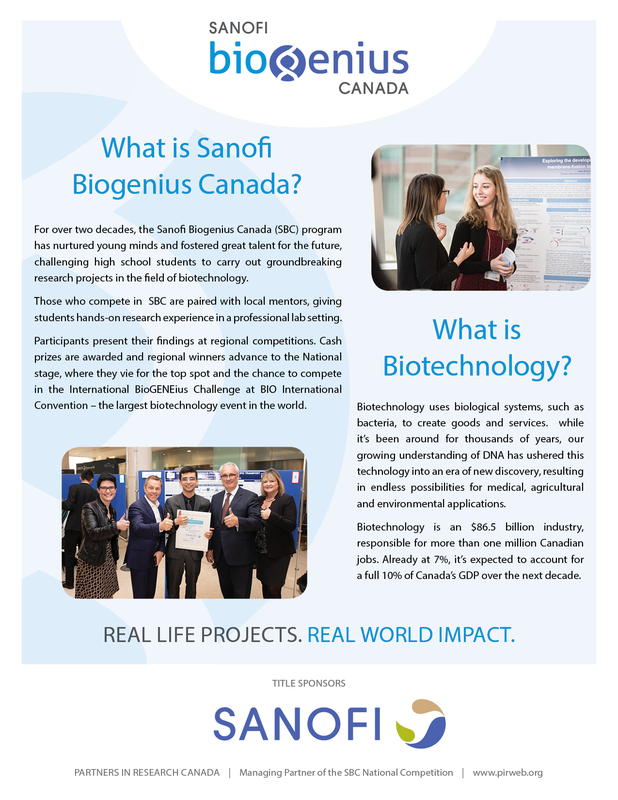 Sanofi Biogenius Canada began in the Toronto area in 1992, aimed at raising awareness among students, educators and the public about the emerging field of biotechnology. Quickly gaining traction over the next two decades, the SBC now hosts annual competitions across every Canadian province, as well as extending its reach globally, with competitions in Australia and the U.S.
Partners in Research, national coordinator for the SBC since 2013, helps Canadians understand the significance, accomplishments and promise of biomedical research in advancing health and medicine, with an emphasis on Science, Technology, Engineering and Mathematics (STEM) as fields of discovery and study for Canadian students. Click your region below to jump to your past regional winner!